While this topic is known by many as a beginners step to debugging, I have seen cases (including myself a while back) where unnecessary extra debugging has occurred in attempt to monitor a variable for a specific value. Below I will highlight a quick and simple way to set up a conditional breakpoint in VS.NET. This breakpoint will only be hit once the condition we set is = 'True'. This method of setting up a conditional breakpoint can be quite useful when looping through a large list of values, and the developer wants to only debug the code once a certain value has arisen. In the code below, I created a simple ArrayList and added some characters to it (A-G). Now let's say that I really only want to debug once the variable 'alItem = "D"'. Well I could place a breakpoint on the line that reads 'MyValue = alItem' and keep pressing 'F5' on the keyboard until the value of 'alitem = "D"', or I can set up a conditional breakpoint, so execution only stops once the value I want is set. Lastly, run the code. You will notice that the code will only break execution when the condition we set up is 'True' as pictured below. That's it! Hopefully this will save you a little time debugging in the future. Recently I was developing a WCF service in VS.NET that needed to consume and make a call to a .asmx web service. Typically consuming a web reference from Visual Studio is as straight forward as right clicking the project in Solution Explorer and selecting 'Add Web Reference...'. In my VS.NET 2008 WCF project there is only the option to 'Add Service Reference...'. So how do I add a .asmx web service? 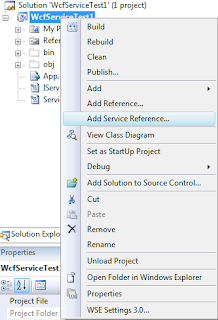 It is still easy to do to a WCF Service in VS.NET 2008, but it is a bit more hidden in the menus, so I will show you how to do it. At this point the more familiar 'Add Web Reference' window will be displayed where you can enter your .asmx URL and proceed to consuming the web reference to your WCF project. In this case you can change your ‘UpdateProperty’ method to use Reflection to map the property name on an object using its String name equivalent. You can infer the UI element to property name logic mapping inline in the call to your new method. This saves a lot of code, especially if you have more that 5 properties that are involved in the ‘Case’ statement. 'Set the value on the object passed in using the setvalue method on the reflected property. So there you have it; the (2) lines of code using Reflection replaced the larger ‘Case’ statement needed to determine which property to update. Of course, the example used here was not the only use for this method and could be applied in many situations. The main goal was to show how to reflect properties using their String type name equivalent. There is some overhead associated with Reflection in .NET, but we can leave that for another day. Depending on its usage, this method can save a lot of code and be used not only with object properties, but in calling methods on objects by their String name as well. This industry more than most can humble one's opinion of how much they think they know, quickly by doing a quick search of the latest technology, architecture, design pattern, etc. and realizing you can't know it all. But this very fact is also one of the best parts of the industry as well; there is always more to know and another challenge around the corner. I guess that is why now more than ever I am so engaged in creating applications, writing code, and learning something new every day. In this process of becoming a more seasoned developer I believe it is important to know that someone will always know more than I do (young and old), and it is OK to be wrong (hopefully not a lot, but hey it happens). This is one important way to become better in what we do; learn from our mistakes and grow from them.